Your kitchen countertops are where your life's business gets done. They're where you set the mail, prep the meals and help the little ones with their homework. It's where your family gathers to talk, plan and prepare for its days. 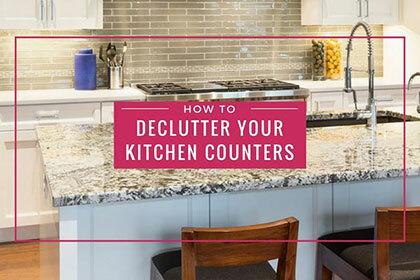 It's enough to make you wish you had a plan for de-cluttering your kitchen countertops. Put a basket on the countertop and make sure that it's where you put your mail, notes from your kids' teachers and other daily correspondence. Having it all in one pile will go a long way toward keeping your countertops clean and orderly. Dirty dishes and those that have been washed and left on the counter to dry are probably the most common causes of cluttered counters. One way to address this is to wash the dishes as you go, and then dry them and put them away immediately. Not only does this shorten your after-dinner clean-up routines, but it also keeps dishes from piling up on your limited counter space. Sometimes a simple hook can go a long way toward helping you de-clutter. Install hooks in the ceiling from which you can hang your pots and pans. Put some hooks on the inside of your cupboards and use them to hang towels and even some utensils. Accessorizing your kitchen with hooks is a simple way to de-clutter. Sometimes there simply isn't a place to put something, so it gets left on the countertop and creates clutter. The best place for these items is in a junk drawer, a place where anything and everything can live so it's out of site. If you clean your natural stone kitchen countertops every night, you'll be forced to clean up the clutter. Natural stone countertops–like those available through JSC Stone, look great. So de-clutter and enjoy them!